Nomblot - Artisan Barrels & Tanks, Inc. The Nomblot family started working in the concrete business in 1922, in the heart of Burgundy, France. They were concrete vault makers whose product was often adapted for making wine, and these early wine tankes were all square or rectangular in shape. In the eighties, the third generation representative, Marc Nomblot, started crafting specialized concrete wine tanks that included round and oblong tanks, truncated tanks, as well as Egg shaped tanks. In 2011 the large concrete company Bonna Sabla purchased Nomblot, but has carefully maintained the original company’s philosophy and practices, and Nomblot/Bonna Sabla remains the only specialized concrete wine tank producer in France and is by far the leading expert in the global market. They now sell tanks all across France, as well as in Australia, Austria, Canada, Germany, Italy, South Africa, Spain, Switzerland and the United States. 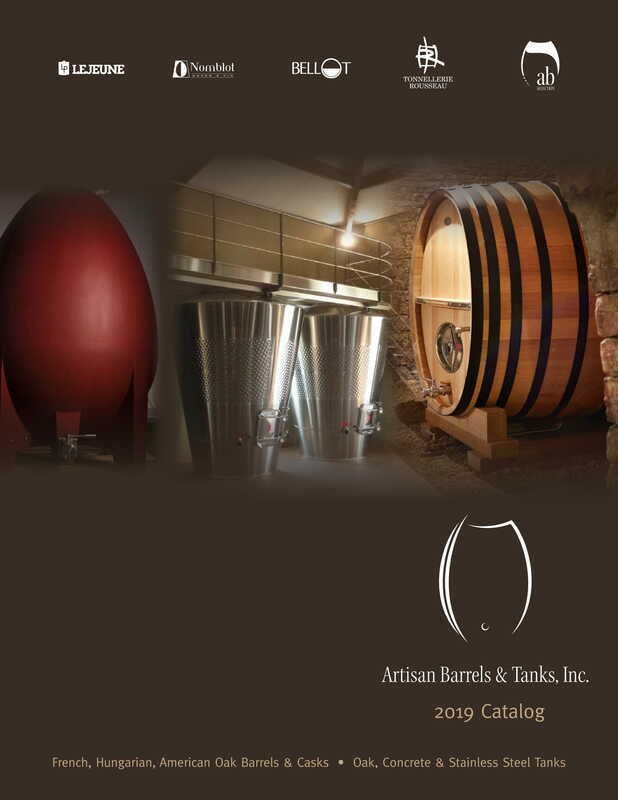 After over 90 years specialization in wine tanks, Nomblot’s now dazzling array of fermentation, aging and storage tanks include all sizes (from 270 L to 250 HL) of traditional Burgundian square formats as well as round, oval, conical, and even vertical or horizontal elliptical egg and amphora shapes as developed for Domaine de la Romanee-Conti and Michel Chapoutier. The company also provides custom-designed products. These specialized concrete tanks offer excellent thermal inertia, as well as controlled micro-oxidation, and are of course flavor neutral and durable. In effect, they offer a combination of some of the best qualities of stainless steel and wooden tanks. Wines fermented in concrete display more weight, fruit intensity, texture and minerality than the same wines aged in stainless steel or plastic. Over the years, Nomblot has earned an excellent reputation, selling over 15,000 concrete tanks to the most prestigious wineries throughout the world including, in California: Araujo Estate Wines, Bryant Family, Cayuse Vineyards, Corliss, Kosta BrowneQuintessa, Rudd Vineyard & Winery, Screaming Eagle, Sine Qua Non, Viader Vineyards, Vineyard 29 and Wind Gap Wines; and in France at Domaine de M. Chapoutier, Domaine du Comte Armand, Domaines des Comtes Lafon, Domaine de la Romanée-Conti, and Château Pontet Canet in France. For a complete list of references, please click here (link to pdf of our reference page). For more information, please refer to Nomblot’s website: www.wine-tanks.com.